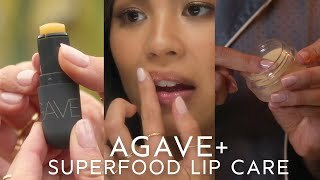 A clean, vegan, cruelty-free and gluten-free lip balm that hydrates up to 8 hours, with a luxurious glide and no waxy feel. Yes, please: Vegan, plant-based oils. No thank you: Petrolatum. 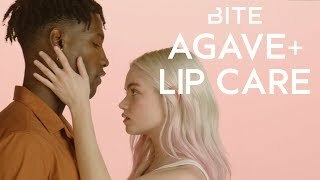 Swipe, go, kiss, repeat: BITE’s beloved Agave lip balm gets revamped and amped up so it’s now clean, vegan, cruelty-free and gluten-free—and with long-lasting hydration, up to 8 hours. You’ll reapply because you want to, not because you have to. Packaged in our iconic “pill,” it tantalizes with a delicious, sweet orange-vanilla flavor. We promise—you’ll love it so much you won’t want to keep it to yourself. Mongongo oil is derived from a tree that thrives in desert conditions; it’s packed with vitamin E and omega-6 fatty acids. If it can withstand the desert, imagine what it can do for your dry, parched lips! Cocoa butter acts as an emollient for more hydrated and supple—AKA more kissable—lips. Ingredients: Polyglyceryl-2 Isostearate/Dimer Dilineolate Copolymer, Caprylic/Capric Triglyceride, Oleic/Linoleic/Linolenic Polyglycerides, Tricaprylin, Cetearyl Candelillate, Hydroxystearic/Linolenic/Linoleic Polyglycerides, Octyldodecyl Oleate, Schinziophyton Rautanenii Kernel Oil, Polyhydroxystearic Acid, Theobroma Cacao (Cocoa) Seed Butter, Coco-Caprylate/Caprate, Disteardimonium Hectorite, Silica, Aroma/Flavor, Oryza Sativa (Rice) Bran Wax/Oryza Sativa Bran Cera, Triethyl Citrate, Polyglyceryl-3 Polyricinoleate, Allantoin, Agave Tequilana Leaf Extract, Ricinus Communis (Castor) Seed Oil, Momordica Grosvenorii Fruit Extract, Limonene, Linalool.